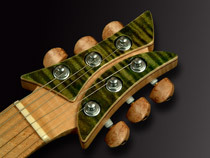 The FRANK HARTUNG GUITARS headstocks are kept very compact to enhance overtones. Still there is enough room for an unhindered access to the tuning machines. The strings are led over the nut almost in a straight line. 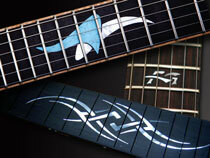 Through their 3-dimensional appearance, our headstocks provide a distinctive visual impression ? see it once, never forget it. My exclusive and protected FLOW CARVING design is absolutely unique in the world of guitars. In search of a new independent design, I developed it in 2002. The contour lines run fluently into the surface and add a 3-dimensional effect to the overall appearance. It seems as if two top planks melt into each other and shape a perfect object. This striking feature is completely hand-made and creates a unique design. I use Ebony, Rosewood, Maple, Ziricote and sometimes also the sought-after certified brazilian Rosewood for the fretboards. They receive a compound radius for better playability. The fretboards are end-closed, i.e. the fret slots are cut in a way that they do not span the complete board width. 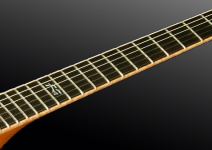 The fret tang ends are undercut 2mm on each side before the frets are installed, thus the fret ends cannot stick out. The inlays are made from mother-of-pearl, abalone, artificial stone or wood. Special orders such as logos, symbols or scripts are realized upon customer request or following detailed drafts. This gives the whole custom-made instrument a very personal touch. Für die Hälse kommt bestens selektiertes Tonholz zum Einsatz. Die Oberflächen (außer Mahagonie Hochglanz) werden mehrfach ultradünn lackiert, sodass von Anfang an ein sehr vertrautes und griffiges Spielgefühl aufkommt. Die Halsprofile werden nach Kundenwünschen angepasst,gegebenfalls kann eine Halsanpassung in der Werkstatt vereinbart werden. The own developed Hartung Tailpiece is designed to deliver the massive sound of a solid wraparound tailpiece, but it also ensures the adjustability of the intonation. Through specially designed V-saddles, there is no loss of contact between milled aluminium bridge and bell brass string saddles. And that’s guaranteed that the frequencies will be transmitted to the highest degree. I use Harry Häussel pickups as standard. 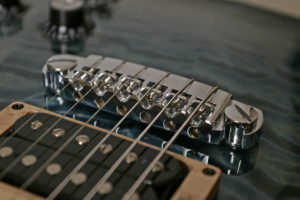 These individually hand-wound pickups are famous for their open tone development and definition. 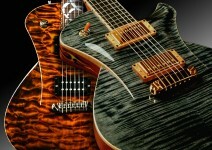 They are custom-made for FRANK HARTUNG GUITARS, thus being able to regard special requests anytime. 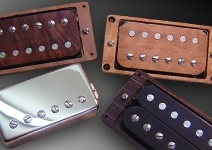 Of course I also offer pickups from other manufacturers such as Gerold Pickups, Bare Knuckle UK or Kloppmann. Good tone wood is the major component of my instruments. The used wood is hand-selected and well seasoned before being used. Thus I carry a large stock of material, including rarities such as real Honduran mohagany or brz. rosewood. Do you have any special requests? Let me know. 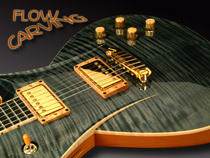 It´s my pleasure to send pictures of tops to choose from for making your guitar. 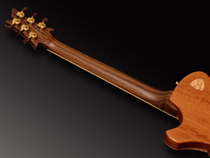 Possibly the most distinctive feature of FRANK HARTUNG GUITARS is the design of the shapings. Every body is hand-shaped and thus becomes an unmistakable and individual item. 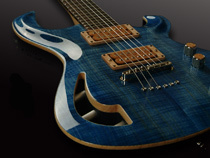 With great attention to detail and technical perfection, instruments are created that have a guaranteed unique recall value. My guitars are factory-fitted with a set of 10-46 strings. Here I use D’Addario NYXL strings, which are distinguished by superb tuning stability from the beginning. They have a high-carbon steel alloy which makes them more resistant to tearing up to 30%. It can be used other strings, depending on customer requirements. More informations here.